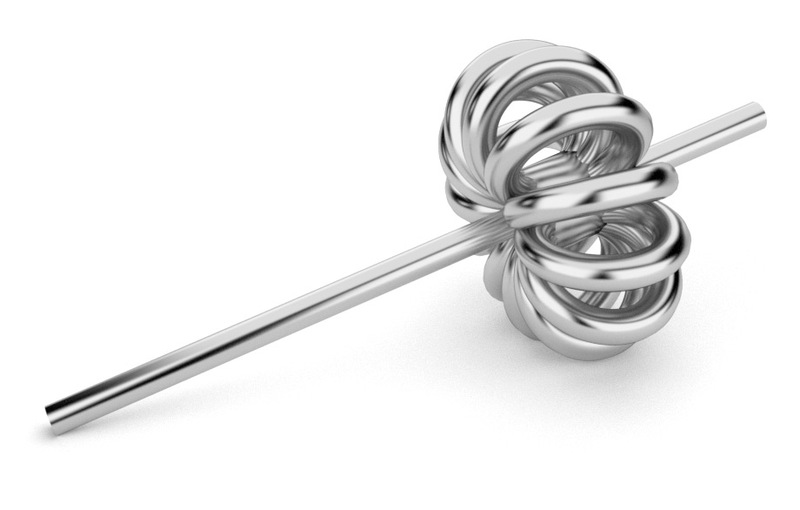 A metal drinking straw with several decorative loop-the-loops in the mid-section. Each looping pathway is spaced out radially, so the overall effect is of a wireframe toroid at the halfway mark of the straw. Hidden in the middle of this elegant mess of tube is a valve block. Each loop can be switched in and out of the fluid route by means of a series of bimetallic disks. Each one trips at a slightly different temperature along the scale from "Youch!" to "Aaah". At one extreme, liquid travels through every loop sequentially. At the other, it bypasses them all and heads straight for the gob. Assuming all of the mechanical details can be worked out, and some system to keep the temperature-sensing parts close to the coffee while keeping the valve block at a distance (possibly involving pushrods) can be devised, the result should be an automatic thermostatic drinking device that selectively cools your cuppa to always hit "Aaah". There is actually a market for this. Ideal - plus, I can imagine being able to exploit the inherent digitisation problem through price differentiation and develop a range: Sport, Bronze, Silver, Gold, Platinum, Obsidian and of course, Harlequin. i.e. A range of products each with some linear increase in selectivity. Those with only enough cash to deploy on the "sport" version might get 3 degrees of temperaturisation control, while early-adopting A1's can splurge their disposable income on a magnificent 32-level beverage temperature ensmoothment system. //A range of products// That flies in the face of modern marketing practice. What you want is a single product, sold under a range of names. Much more cost-effective. If some of the coils passed through a small gas flame it could even be used for cold coffee. If you posted this on the same day you thought of it, it looks like you and I had hot drink temperature regulation ideas on the same day. Mine needs a bit more thought and research before I post it, though.